Some makerspaces are set up in separate rooms down the hall, in the library, or in another building. Kids may only be able to use the makerspace once a week or month. Some activities may focus on how to use the resources available and not connect the activities to the curriculum or around a real world problem. If this is how the makerspace is set up in your school, then your kids may not have access to the resources, materials, and tools when they need them, especially for STEM or STEAM. This is why we decided to focus on this topic for #plearnchat and created a planning tool for makerspaces in the classroom using the Design Thinking Process and Universal Design for Learning®. 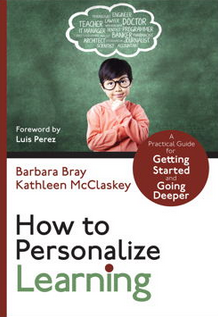 For more information about this process and the Planning tool, go to the post Design Thinking & UDL Planning Tool by Barbara Bray and Jackie Gerstein. 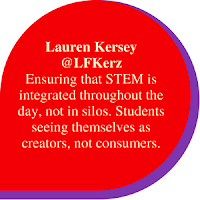 We would like to thank Dr. Jackie Gerstein, @jackiegerstein for being the co-host for #plearnchat. 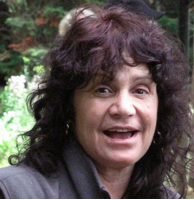 Dr. Jackie Gerstein's byline is, "I don't do teaching for a living. I live teaching as my doing . . . and technology has amplified my passion for doing so." Gerstein has been teaching in-person and online for several decades. Currently she teaches master's-level online courses in educational technology for Boise State, American Intercontinental, and Western Governors' Universities. The big question: How can a maker and design thinking mindset encourage deeper learning for STEM and STEAM? 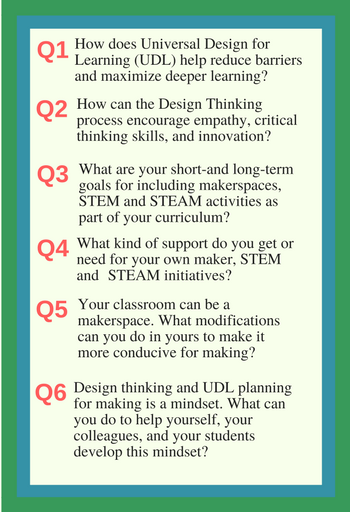 The questions scaffolded using UDL and Design Thinking to build a maker mindset. The conversations went deeper as the hour passed and brought up multiple retweets and resources. 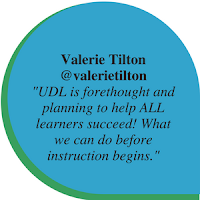 "UDL provides Ss with supports so that they ask questions, create agency and take ownership of their learning." "When UDL is used to empower learners and how they learn, then self advocacy and deeper learning can result." "By providing multiple means of engagement/representation. 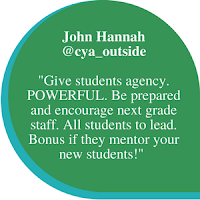 Teachers ensure all students are involved in learning." "By giving students freedom to express their own ideas and share with one another. Also allows students to give feedback to one another." "Design thinking forces learners to put their ideas forward to be tested. They own the risk." "Encourages innovation by giving students freedom to explore with no fear of failure." 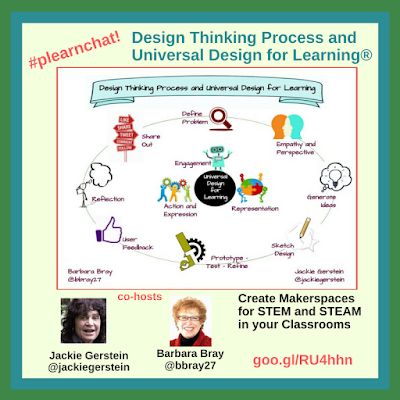 "I love the marriage of design thinking with makerspaces. It gives just enough structure for meaningful making. 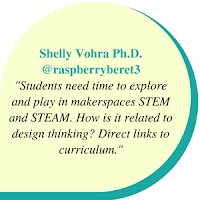 :o)"
"Makerspace Goals: Short--Learn new tech tools and projects over summer. Long--more cross-curricular maker opportunities." "For math, UDL can allow students to show multiple representations of the same material to show they truly grasp the material." "A culture that fosters risk-taking is a must have! And chances for teachers to collaborate authentically." "We know silos don’t work….learning doesn’t stick for long. CONNECTIONS are where it’s at!" "Mindfulness can help Design Thinking in Education. Everything starts with oneself." Kathleen Johnson just finished her 3rd year of teaching after graduating from Clemson University in 2014. She works with all the freshmen at Greenville High School in Greenville, South Carolina teaching both Algebra 1 and Geometry. 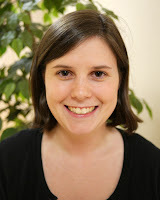 She has just begun classes to get her masters in Educational Technology from Boise State. Kathleen helps lead FCA (Fellowship of Christian Athletes) at her school as well. She's currently a part of a digital learning community of 8 teachers from her school to help the entire school prepare to go 1:1 with chromebooks in the next 2 years. "I really enjoy not just teaching my students but building relationships with them in other ways such as attending their sporting events, concerts, art shows, etc. My classroom is always open at lunch as well as I really enjoy when students come to eat with me in my room!" "Remind yourself it doesn't hurt to try. Encourage and help other teachers. Ask for teachers to come watch and gain feedback. " 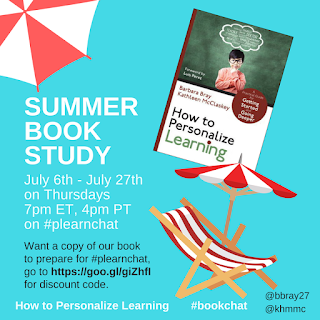 Join #plearnchat for the month of July for #Bookchats on specific chapters from our book, How to Personalize Learning. 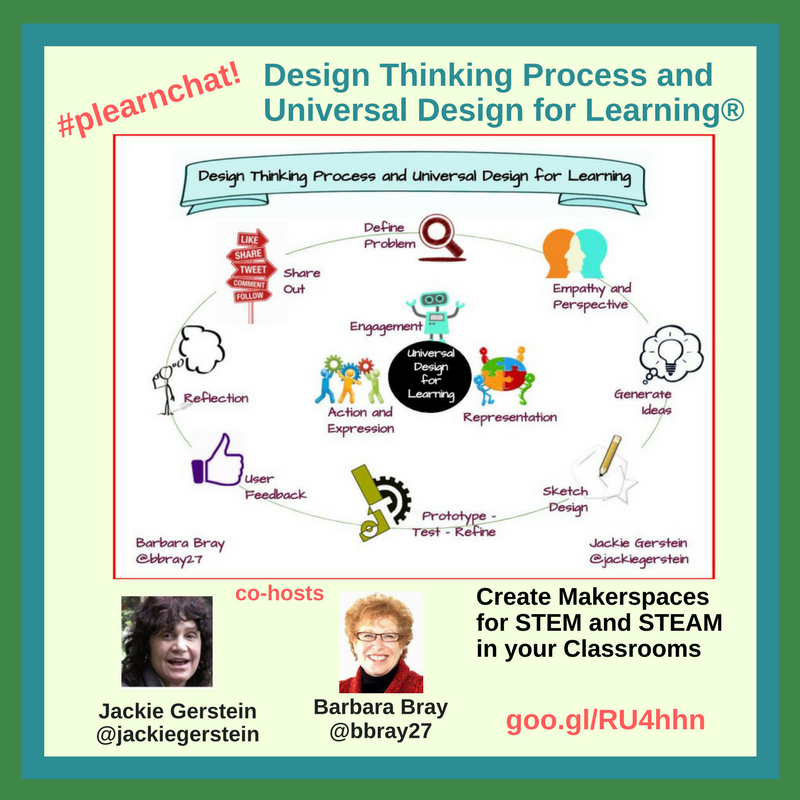 We archived the entire #plearnchat about Design Thinking and UDL to create Makerspaces for STEM and STEAM classrooms below for your convenience and as a resource.